Feng Teng (Hans Zhang) is a rich heir and the president of a giant conglomerate. He has a younger sister, Feng Yue (Zhangyang Guo Er), with a very rare blood type. Therefore, he recruits Shan Shan (Zanilia Zhao), who shares the same blood type as Feng Yue, into the company to be a blood donor. Interesting anecdotes occur when Feng Teng intentionally tries to fatten up Shan Shan, who loves eating. When Feng Teng's childhood friend, Yuan Lishu (Li Cheng Yuan) returns to the country, she is dismayed to discover that Feng Teng is in love with Shan Shan. She tries to compete with Shan Shan for Feng Teng's love. Together with Feng Teng's best friend, Zheng Qi (Huang Ming), the two tries to separate the couple by inciting conflicts. Don’t ask me why I watched this. The plot didn’t appeal to me nor did I know the cast. I knew nothing about this drama, I just wanted some mainland drama and brush up my broken mandarin. 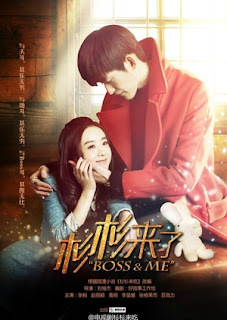 That lead me to this drama, it’s on many peoples’ top favorite mainland drama. Why? I won’t blame the really bad execution of the whole production, because I’ve seen some great mainland dramas, where everything else triumphs that. Yet, nothing in this drama made sense for me. The whole storyline with him feeding her so they can pump her for blood now and then was really hard for me to stomach. Many loved this drama, I didn’t, so I won’t say anything bad about it, just that it’s going to be a while before I watch a mainland drama again.